The fast pace of globalization, with all of its benefits, is also accelerating the viral spread of hatred. Where once regional enmities brewed for centuries with sporadic outbursts of warfare and imperial powers that waxed and waned, the truly global speed and scale of ideological hatred and international conflict was not possible until recently for many practical reasons. One hundred years ago, World War I changed all of that, throwing us headlong into a series of large regional and international conflicts. The rise of successive totalitarian regimes created the most violent period in the human experience from which we have barely recovered. But governments were the prime instigators. We have now entered the age of movement led conflict. 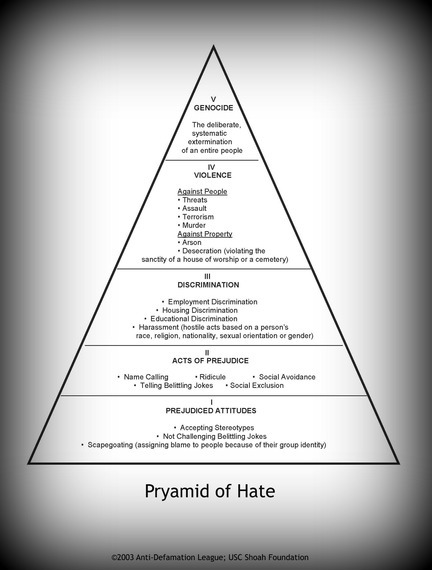 Image from Pyramid of Hate Exercise, online lesson that integrates testimonies from the Visual History Archive with the Pyramid of Hate, a curricular tool developed by ADL. In our newly connected world, the spread of ideas, aided by the lightning methods of communication has democratized the freedom of expression. The obvious upsides of such globalization engender new friendships, break down barriers, and leverage social networks we could not have dreamed of just a decade ago. That precise mechanism is also being used for the spread of confusion and ill intent, as witnessed by the blizzard of social media based content about current conflicts. The spasms of violence burning around us today are as bad as I recall in my lifetime. There may not be a world war by definition, but we do have a world at war with itself. I'll include just a short list: the rage of Hamas provokes yet another conflict with Israel; a civilian plane is shot down in broad daylight in the Ukraine; young girls are kidnapped and their town captured in Nigeria; a little known Islamic sect conquers much of Iraq and part of Syria, and cleanses the region of Christians; Syria itself devours its own populace daily; a kid from Melbourne blows himself up in Kabul, Hamas kills three teenagers on the West Bank, Jews burn a Palestinian child in Israel; a rabbi is shot dead in Miami; French Arabs burn Jewish stores in Paris. Meanwhile, killings, sexual violence and rampant terrorism in South Sudan, Egypt, Libya, North Korea and Iran are so mundane they barely make news. The driving force behind each outburst is not identical, but they stem from the same roots of desperate insecurity, utopian ideology, and the reassertion of ethnic and religious identities over the nation state. It would be so much easier if it was about money, resources or land only, but even here, they do figure as causes, they are not the primary cause. As borders and boundaries melt into what we thought would become a global village, it is the fight for group identity which splinters us into thousands of micro communities, all clamoring for physical, philosophical and political space. 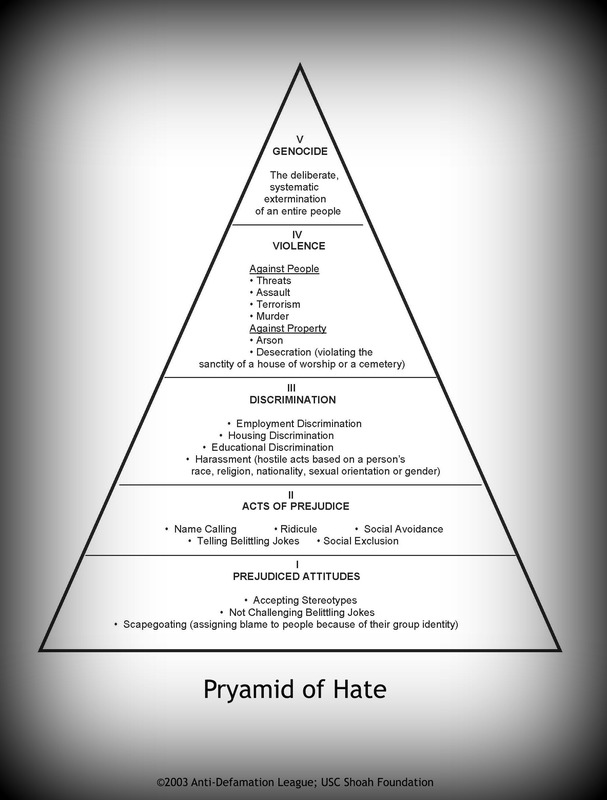 Ideological violence is used as a marketing tool. The Islamic State (ISIS) filmed a suicide bomber as he drove a truck filled with explosives to its final destination. When they posted the moment of lethal glory, complete with music track and several camera angles, they gave a face to the bomber all over the world. When we watch the beheading of their captives, they intentionally make us part of the story too. Warfare, once solely about defending or gaining territorial, economic and political control, is now as much about controlling the global audience. We are all implicated in so much more than ever before, as the battle for public opinion rages all around us. The bigger the audience, the higher the stakes. Boko Haram, an otherwise insignificant group, has global reach because its extremism gets airtime. They carry out kidnappings because they know the story will carry, and their ideology gets heard. The petri dish where the hateful contagion grows is right at our fingertips. But the web of hatred is offline also. A group in Paris can take to the streets coordinating their message with a bunker in Gaza. A recruiter from the Islamic State will scour the mosques of London for fresh laborers for its global Jihad. The web of violent factions is being spun around us, and is essential we recognize that before it is too late. Extremist Muslim groups are not the only ones globalizing hatred, but for now they have cornered the market. The bile that poisons the current wave of anti-Semitism, and the purposeful erosion of moderate values within the Muslim world is set to continue for sometime. The only way for this to be assuaged is for Muslims themselves to find and take back the middle ground. While it has never been easier to create a web of hatred online and off, it is still possible to harness the power of the Internet, and our network of communities offline, to create a counter insurgency. Movement-led hatred may have the upper hand for now, but movement-led peace, based on knowledge, respect and sharing, can still win the war of globalization at its very best.